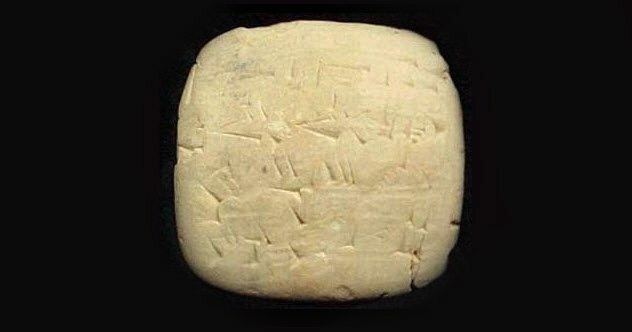 Beer is at least 10,000 years old, with ancient tablet inscriptions discussing it as far back as 3400 BC. Obviously, people have been getting drunk for an incredibly long time. In fact, the history of beer provides us with both a fun and fruitful window into long-dead cultures of the past and how they behaved. Did you know that you can live on just beer and water alone? Anyone who had a wild youth can confirm emphatically that, yes, you certainly can. Here are 10 monumental moments in the history of beer. When joking with friends, we commonly refer to various foods and beverages today as “the nectar of the gods.” But in ancient Sumer and elsewhere in the Fertile Crescent, beer was actually thought to be the drink given by the gods due to its intoxicating power, nutritional value, high calorie content, and relatively simple recipe. 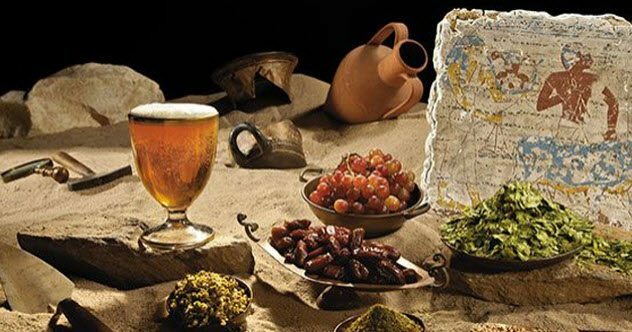 Although it’s impossible to pinpoint a specific date for the invention of beer, it definitely existed between 3500 and 3100 BC in a settlement called Godin Tepe (now part of Iran). This is considered the beginning of beer brewing in the West. However, the ancient Chinese had it as early as 7000 BC. Sumerians and other early cultures cherished this drink much like we do today. In fact, without beer, cultures in this early time period would not have been able to advance, at least not as quickly as they did. Not only did beer provide a good reason to trek 320 kilometers (200 mi) to another city to conduct trade, but it also made for an ultra-portable food and source of nutrients. Grains and cereals are much easier to grow, carry, and generally maintain than fruits, vegetables, or livestock. Simplicity at its finest. There is some evidence of beer predating bread, and it’s extremely possible that beer was developed first in experiments attempting to create bread. It is thought that the people in the settlement at Godin Tepe may have been drinking beer as early as 10,000 BC, which would make beer more than 12,000 years old. 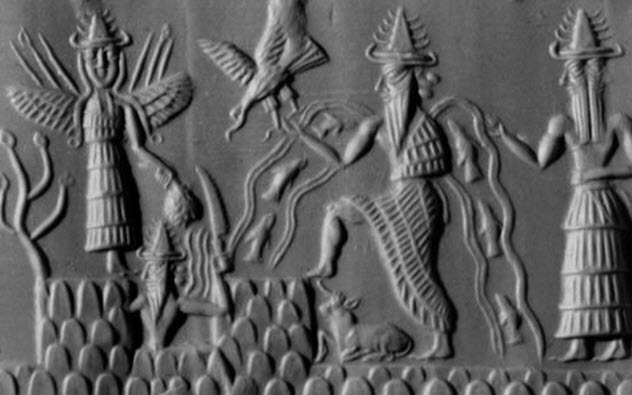 In the poem, the god Enki and the goddess Inanna get drunk together. After Enki gets absolutely hammered, he inadvertently gives away the laws of civilization (and thus the power) to Inanna. This is thought to represent a pivotal transfer of power between two cities in the ancient Middle East—Eridu (the city that worshiped Enki) and Uruk (the city that worshiped Inanna). The famous poem “Hymn to Ninkasi” was a recipe for ancient beer. Ninkasi was the ancient Sumerian goddess of beer as well as physical beer itself. It was thought that she transferred into you when you drank beer that was brewed with her recipe. This similar to the concept of Communion in Catholicism. It was thought that the gods gave beer to man for happiness and general well-being. The recipe in the poem was also a song that could be easily remembered and recited in an age of illiteracy and lack of public education. It was much like our national anthems or the other modern songs we all know by heart. Stop and think about that for a second. 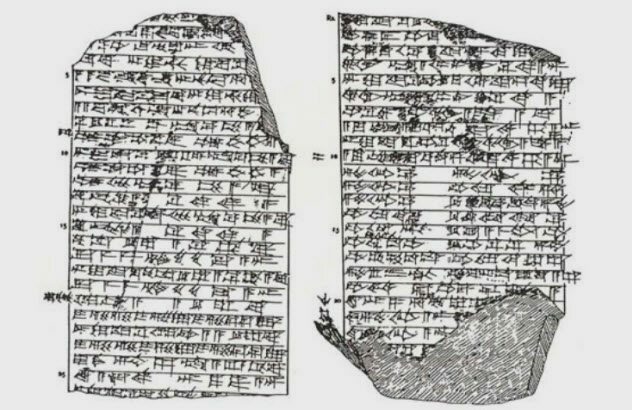 The ancient Sumerian national anthem was a song that detailed how to brew the best beer. Nice. The Epic of Gilgamesh, one of the first-known tales of civilization, details a story of the epic hero, Enkidu, who becomes civilized once he’s taught how to drink beer. This was done in religious settings, of course, as religion and beer had been practically married since the beverage was first developed. The Sumerians slowly but surely perfected the process, which resulted in several different recipes. Just like that, the first bars and liquor stores were born. 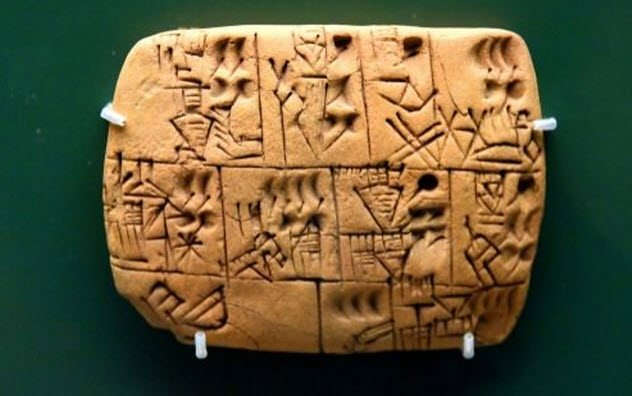 In a document written in cuneiform, we have what was described at the time as “the best beer.” It is a receipt to a clerk for the purchase of beer from a brewer named Alulu, who apparently had the best stuff in the city of Ur during the reign of King Shulgi. This is the only document known to survive from the city of Ur. Debauchery, war, chaos, sexual promiscuity, lust, and rampant drunkenness—ahh, the glories of ancient Greece, the nation to which Western cultures owe so much of their roots. The land was built largely on trade, particularly of olives and olive oil, a delicacy in and around the Mediterranean in ancient times. Grapes, wine, bathhouses, and drunken orgies to the gods were commonplace in Greek culture. But newly unearthed evidence is showing that beer may have been a major factor in ancient Greek civilization. 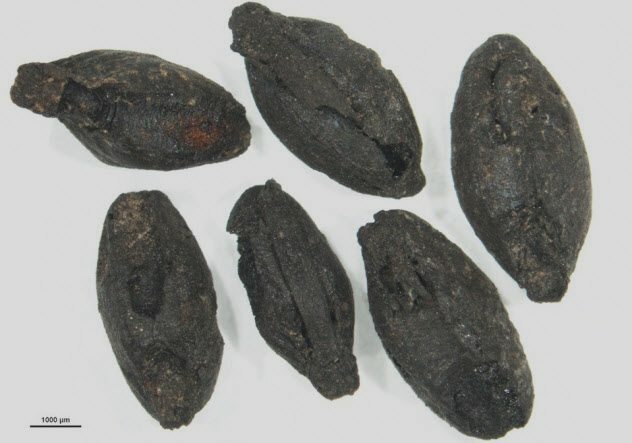 In the ancient cities of Archondiko and Agrissa, archaeologists have found thousands of grains of cereal that date to around 2100 BC, which is the Bronze Age. Both cities had been destroyed by fire and abandoned by their people. Although we don’t know precisely when or where, someone had to invent the first drinking game. We do know that one of the earliest-known drinking games, kottabos, was the grandfather to all the ones we know and love today. Kottabos was a mixture of beer pong and modern games where the players sit around a bucket or bowl placed in the center of them and throw objects at or into it. Except in ancient Greece, slaves cleaned up the mess afterward. 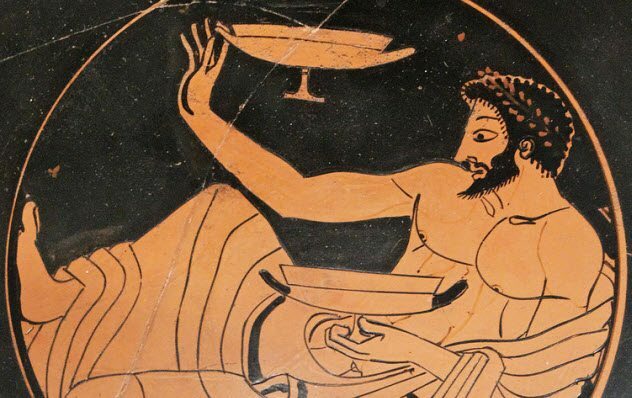 At a symposium, ancient Greeks would get hammered and do the same silly yet delightful things we do today. To play kottabos, the drinkers would take a bucket or large bowl and place smaller discs or bowls into the larger one. Then the players would throw objects into the contraption in an attempt to sink the smaller objects. Another version was to throw an object to knock a disc off a metal stand in the center of the room. Thousands of years later, it seems not much has changed. Beer was introduced to medieval society through ancient Rome and continued to be a religious staple for hundreds of years. Many monks desired a simple life of farming, worship, Christianity, and the self-denial of pleasures. But one thing was nonnegotiable—beer. 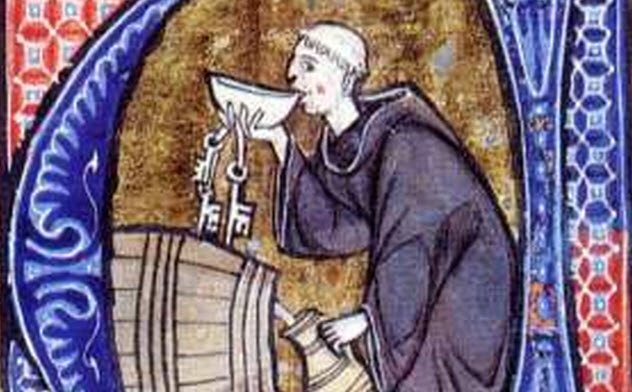 This drink was a way of returning to a less sinful life for the monks of medieval times. Although hops had not been introduced into beer yet, the beverage was significantly stronger in alcohol content. 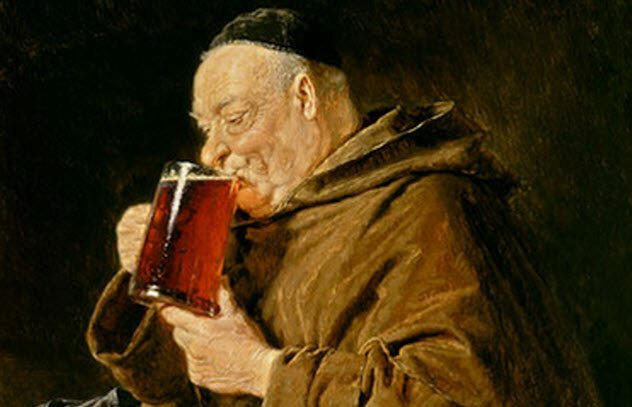 Medieval monks added everything from cinnamon to chicken extract to their beer to try to make the flavor better. Not only did beer come to the rescue when human civilization was in its infancy, but it also saved the human race in the Middle Ages. Beer provided an easy way to get calories and liquids into the body in ancient times when water and other sources of nutrition were hard to come by. Then along came Greece and Rome, the pinnacles of ancient society. Rome built aqueducts and devised ways of transporting and filtering water that the world had never seen. After the collapse of the Western Roman Empire, however, the invading Germanic tribes laid waste to much, including the massive body of knowledge previously gained in ancient times. Water filtration systems were also forgotten. Contrary to popular belief, beer is the only alcoholic drink that hydrates you because it’s 95 percent water. During ages riddled with plague and other diseases and with the Roman methods of cleaning water long gone, beer was again the savior of the human race. With its antiseptic qualities, it provided a surefire way to deliver water into the bodies of people who desperately needed it. After the collapse of Western Rome, no one experimented with water filtration again until Sir Francis Bacon tried it in 1627. The Renaissance further developed alcohol production, probably by the creation of gin and grain alcohol by the Swedes or the Dutch. Both populations also played a large role in the process of distilling alcohol made from beer. In 1469, the first grain alcohols and gins were developed. 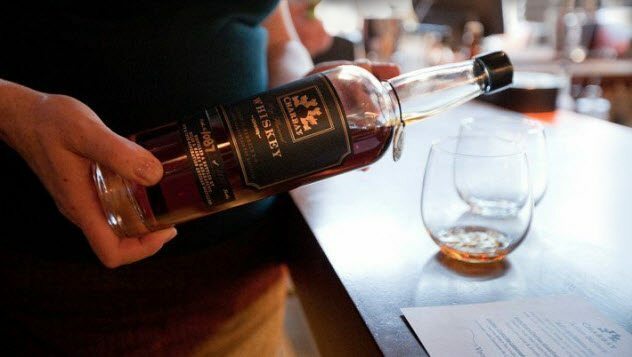 Then, in 1494, whiskey was produced for the first time in Scotland. Not much alcohol is distilled from beer today. But historically, liquor was initially produced through the distillation of beers. Some groups still engage in the practice. Typically, Lent is a period when some Christians abstain from indulging in various kinds of pleasures until Easter. However, in 1634, the Paulaner monks, who moved from southern Italy to resettle in Germany, decided to switch things around. Rather than abstaining from drinking alcoholic beverages, they only drank beer and water for 46 days. But this wasn’t a group of monks using a religious fasting event as a reason to get drunk. Unlike many people who give up meat for Lent, the Paulaner monks abstained from all food during the 40 weekdays from Ash Wednesday to Easter. To sustain their bodies, they created a beer called doppelbock, which also served as a “liquid bread” containing nutrients and carbohydrates. Doppelbock is much thicker, richer, maltier, and heavier than regular beer. It’s also significantly stronger in alcohol content than common beers of that day. So it seems likely that these monks were drunk the entire time. In the most monumental moment in the history of beer, they also proved that humans can live on beer alone. I like to write about dark, twisted stuff as well as psychology, philosophy, and history. For more fantastic facts about beer, check out 10 Important Advances Made Because Of Beer and 10 Fantastic Facts About Beer.